While Bhargava is right that we need to build a “deep alliance of movement forces” to pursue and win on a progressive agenda, we also need to become more hard-nosed, strategic and indeed ruthless in our effort to weaken the legitimacy and power of the right. Much as conservatives went for our collective jugular after the 2010 midterm elections by targeting the public sector labor movement, we must be willing to go for theirs—regardless of how much more money and power they might have. What would a principled attack strategy look like? It must proceed on at least three tracks: ideological, organizational and structural. On all three, the Occupy movement has been a spark in jump-starting such a national campaign. Ideologically, we need to put forward an alternative economic narrative—and demand that our elected officials embrace it, too—that powerfully counters market fundamentalism and trickle-down economics. One way to do this is to be relentless and repetitive about identifying the “Bush-Romney economy” as the exemplar of right-wing economics and remind people how that worked out for them in the last decade—followed by our alternative vision of shared prosperity and economic justice. 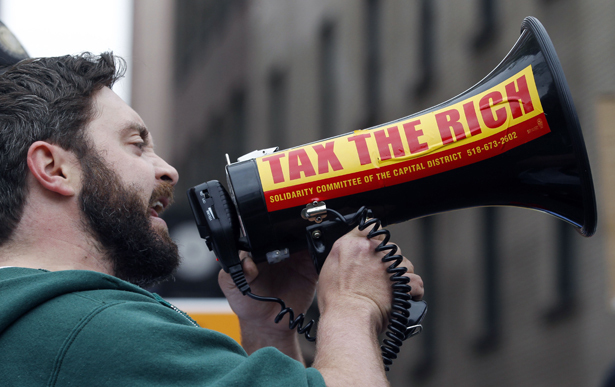 Organizationally, we should draw on the momentum from Occupy and target the 1 percent. I don’t mean merely rhetorically or even symbolically, but institutionally. By targeting the 1 percent, I mean the billionaires, corporations and oligarchs who fund hundreds of political organizations, affect thousands of communities and control millions of jobs. But we should go for the organizational jugular as the right has gone after public sector unions. One idea suggested to me by economist Suresh Naidu is to attack corporate political groups on anti-trust grounds. A serious political and legal campaign to protect voters (and consumers) from political collusion as well as business monopolies and anti-competitive concerted action in the political sphere might be waged against the Chamber of Commerce and the American Legislative Exchange Council (ALEC). Besides attacking these corporate political cartels, we could develop campaigns to identify the “small group of supervillains” who exert outsize economic and political power over all of us and hold them accountable for the injustices from which they profit, as veteran labor strategist Stephen Lerner argues. Structurally, we must reclaim our democracy. We’ve been playing defense in dozens of states against the right’s coordinated campaign of voter suppression. If they really want a fight around voting and inclusion in the polity, let’s give them one. How about launching a true campaign for voter justice that dilutes the influence of their aging and numerically decreasing electorate? Let’s start with a robust debate about mandatory voting—which already exists in many rich democracies—and then make declaring election day a national holiday with same-day registration our compromise position. This would immediately reduce the power of the right’s core electorate and usher in Senator Lindsey Graham’s worst nightmare: a progressive majority that outnumbers the “angry white guys,” not enough of whom exist to keep the right “in business for the long term.” Combine that with a campaign for a constitutional amendment to ban corporate money from politics once and for all. Each of these three tracks worked to bring our first Gilded Age to an end and usher in the New Deal. It’s time to pick up the fight to end this second Gilded Age and usher in a New Deal for the twenty-first century.